I have to be honest with you all, as a blogger and *ahem* “influencer,” I get a LOT of random emails asking me to write about different products or services. I honestly don’t respond to about 99% of them because they have nothing to do with what I write about here or what I think you all might be interested in. Then, a few weeks ago, I was invited to take a look at NakedWines.com and I fell so in love with the company and products that I wanted to tell you all about it! Here is my no-holds-barred, honest Naked Wines review. Get $100 off your first 12 bottle case + Free Delivery! The genius here is that the money serves two purposes at once while it sits in your account, we can confidently invest in winemaking projects around the world. We hire the best winemakers and give them the resources to get the best fruit and the best equipment to make great wine. And because we’re confident that you’ll use the money in your account to buy these delicious wines, we don’t have to invest in sales, marketing and other stuff you can’t taste. Then you get to use your money to get these amazing handcrafted wines, and you get them at Angel-only prices 40-60% off because they wouldn’t even exist without your support. The whole thing is so positive, it makes me smile just thinking about it. Oh, if you ever change your mind, your money is still sitting there in your account and we can refund it in part or in full to your credit card. No problemo! What Kind of Wines Can You Buy at Naked Wines? NakedWines.com sells a huge assortment of wines of all sorts. They invest directly with the winemakers so it’s an amazing way to taste a wide variety of wines that you can’t find in local stores. I really love that you can rate the wines you receive and it will help you find similar ones to try. It’s like your own personal sommelier! So far at NakedWines.com, I’ve ordered a case of reds and 6 bottles of whites and sparklings. Every single bottle I’ve opened has been wonderful. AND I’ve tried some new blends I’ve never had before. For a wine lover like me, this is the best ever! How Do I Buy Wine Online from Naked Wines? There are two ways to buy wine at NakeWines.com. 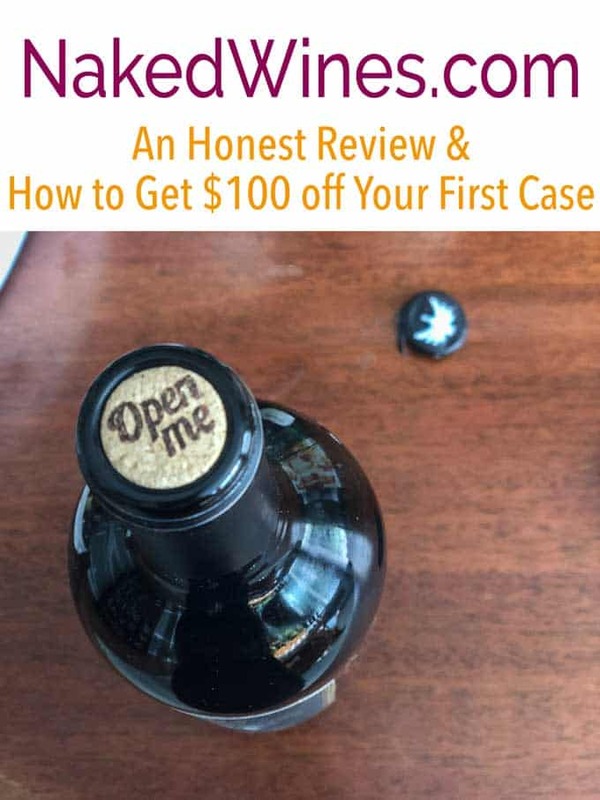 The first is to simply click here to go to their website and order-first time customers can get $100 off their first case of wine by taking a short quiz. This made my first case about $85 with shipping and everything. That’s less than $8 a bottle, and these are GOOD wines. You can’t beat that. The second way you can buy wine at NakedWines.com is to become an Angel. There is currently a wait list for this as they are very smart in scaling the business at a rate they can manage. The waitlist moves quickly though, I started I think about 11,000th in line and am currently rocking about 5,400 two and a half weeks later. What Else is So Great About NakedWines.com? In case my enthusiasm hasn’t come across yet, I just have to tell you again how in love with this company I am, and I recommend them to every wine lover I know. On their website, you can chat with other wine lovers, the winemakers themselves, leave reviews, and learn more about wine. It’s just a gem of a resource! There are groups you can join, or even create your own! Click here to get $100 off your first case of wine. Leave me a comment to let me know what you ordered! Update: I have been a NakeWines.com Angel for two months now. 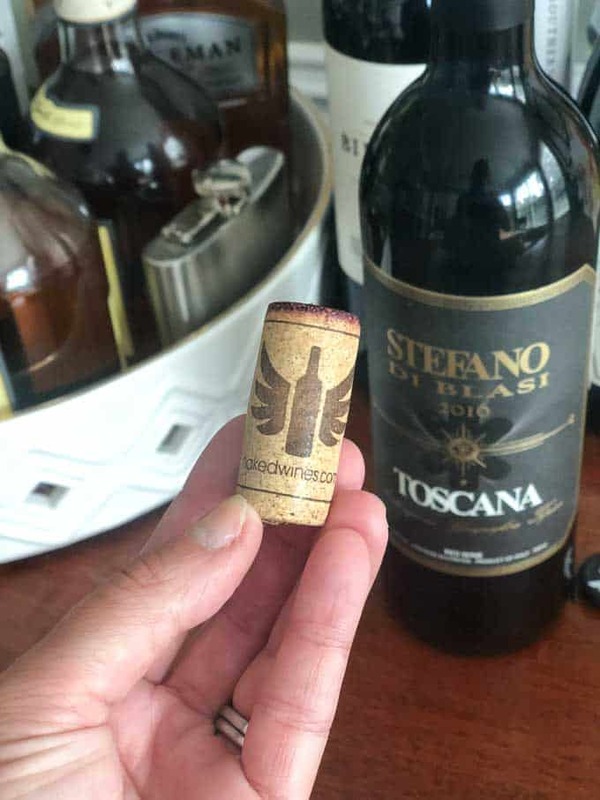 I’m still loving everything about this company, in fact not only was I gifted a free bottle of wine when I finally made it through the Angel wait list, this month is my birthday and I just received a free bottle of $55 cabernet wine as a gift from the company. I’ve also been able to message with winemakers to give feedback and appreciation notes about the wines I’ve tried, and I’m in love with their mobile app as well. It makes looking at tasting notes when I’m opening a new bottle easy and helps me shop on the go. I still 100% endorse this company and have gotten great feedback from my readers who have joined the waitlist too! It thought this sounded interesting so I clicked on the link to go to the site to get $100 off a case of wine. I couldn’t get past the dialog box asking what state I’m in and if I’m 21+. The box wouldn’t go away after I entered my state and I’m 21+. Kind of a problem. These wines look amazing! It sounds like a great business model too – getting the best wine directly from the top sources so you know you’re getting a top quality product. The $100.00 “coupon” is a ripoff. How so Marcos? I used it to reduce the price of my first case while I was on the waitlist for the Angel discount. Using the coupon my first case was less than $90 for 12 bottles and all the wines were excellent. Given a voucher – tried it out – cannot access in Canada. What a farce. Suggest you buy Canadian, maybe from the wine shop down the street rather than from a foreign country. Received my first and only case of this plonk wine. Most are vintage 2017, vinted and bottled by Naked Wines. Ir’s cheap for a reason. My advice, save $80 and buy five bottle of good to VG wines at your local wine shop or grocer. I respectfully disagree…the wineries bottle small batch wines exclusively for NakedWines as part of the program, that’s the appeal. And yes, they aren’t old vintages but when you’re investing in young wineries that’s the fun of it! I know it is not for everyone but I’ve truly enjoyed almost all of the wines I’ve tried from there and the one time I didn’t they backed up their 100% satisfaction guarantee with a refund offered without me even asking. Wines do not have to have an ‘old’ vintage to be enjoyable. In fact 2014 was a very good vintage on the west coast of the US and several parts of the world. My point is, these 16s and 17s have not had enough time in the bottle to deserve being on shelves or boxes delivered to the door. They are ‘wholesale’ for a reason. I’m not being harsh, just honest. I want wines that are drinkable once they arrive and chilled to an appropriate temperature. Laying down the bottles I received could, maybe, deliver good wines and therefore a value…but I doubt it. I can run up to a local Kroger and spend $24 American dollars and have two nice wines for what I pay. Granted, when looks at the average price of ~$7/bottle NW is selling these wines one should not expect 80 out of a 100 rating. Heck they don’t rate 70/100. But my pallet is pretty darn good and I know decent wines when I taste them. I stand by my comments. I’ll not serve these wines before their time. Meaning today, tomorrow or next year. I’ve not requested a refund due to the stilted, almost bot-like replies I have received from them via e-mail pointing out the virtue of buying from NW. I hope you enjoy your wines, but they are not for me nor my family. The descriptions of the wines sold by Naked Wines telll which wines are to be drunk now and and the time within which the wines others are to be drunk. I’ve not had one bad bottle, have had some wonderful bottles, all have been above average; and I have stored a few bottles for future enjoyment. I could not be happier with this, my third wine club, the only one that I will continue with. I received a voucher and can’t use it. It says they don’t deliver to Oklahoma. We are not a dry state. We really wanted to try this wine but, oh well, lost a potential customer. For future reference, Oklahoma is NOT a dry state. We can buy liquor in our convenience stores and grocery stores just like everyone else. 😒 Very disappointed. Kinda same here. I received a voucher in what I think was a marketing agreement with a Jeep parts firm I do business with. When I tried to use said voucher I was told (via web site) that Virginia would not allow the voucher to be used. But wait, there’s more. NW had a “fantastic deal” for me to buy a case at, oh say, $80. I bit and regretted it. So you have dodged a bullet, Oklahoma. BTW, we in Virginia must by from a state operated liquor store. Wines and beers are on the free market, but not distilled spirits. Kentucky isn’t a dry state, but the stupid legislator doesn’t allow alcohol to be mailed – luckily I live near Cincinnati OH and have it mailed there. Probably the same in your state as well – but the wine is great and the Angel program allows you to save up enough $$ without realizing it. I’ve been with naked wines for over a year and I love it. By the time I finish a case, I’ve accumulated enough in my account to buy another case without having to pay any additional amount. I love that I can try wines I never would have thought to try! And they always throw in a free one too. Their customer service is outstanding too. I once had a box deprived to a local Fedex holding station and someone else accidentally picked it up (coinicodentally, the other person was also an angel and didn’t realize they picked up the wrong case). I called them and within 2 hours they located my case and told me o could pick it up that afternoon. All in all, naked wines is a great company with a wonderful operation. And I always have wine on hand now! I am a Canadian and they don’t deliver here so I have a 100$ voucher for someone to use. code zly9181 password asp32xyn I am posting this on 11/19/2018 card say 30 day limit. I used it. Thank you, sir. If you don’t like the wine you ordered, they have a 100% guarantee, just let them know and they will refund your money. I’ve only had one bottle in 8 months I haven’t loved and I didn’t even ask for a refund, they saw my rating and reached out to me to refund my cost! I’m on my second order with Nakedwines.com. So far, so good.. It’s a great convenience for me to order wine 🍷 online. I read all reviews before ordering and have found it to be a fantastic resource. As an example, I ordered a wine that needed time to breathe before drinking. That advice was spot on…I am buying more. I’m not an expert in wine, but I know what I like. Plus, who doesn’t like gifts? I just received a free 1.5L magnum of Scott Kelley Oregon Pinot Noir 2017. I love the concept and the wines. I’m in Oklahoma and my first order is on its way. Haven’t received it yet, so can’t comment on the wine. The first bottle I tried was a Pinot and just ok. I’m sort of spoiled by Russian River Pinots. The second bottle was a huge surprise-a blockbuster cab, as good as the Napa Cabs I like. So I’m very happy and look forward to trying the others. The cab is 2016 Austin Hope. I have a voucher, not sure of expiration date. I wanted to use it but they don’t deliver to Kentucky, it seems like they have a very small delivery area. it has to do with state alcohol laws Rhonda, not Naked Wines. Some states will not allow them to deliver. As an example, I wanted to order an imported beer from Scotland for my husband but I cannot order from the one company I found that has it because they are not allowed to deliver to Georgia, but if we were in Florida we could get it. Nakedwine doubles the cost of the wines they offer. I compared the prices of their wines online and couldn’t believe it. Use the coupon to buy individual bottles of wine. That may be worth it without having to be a member.